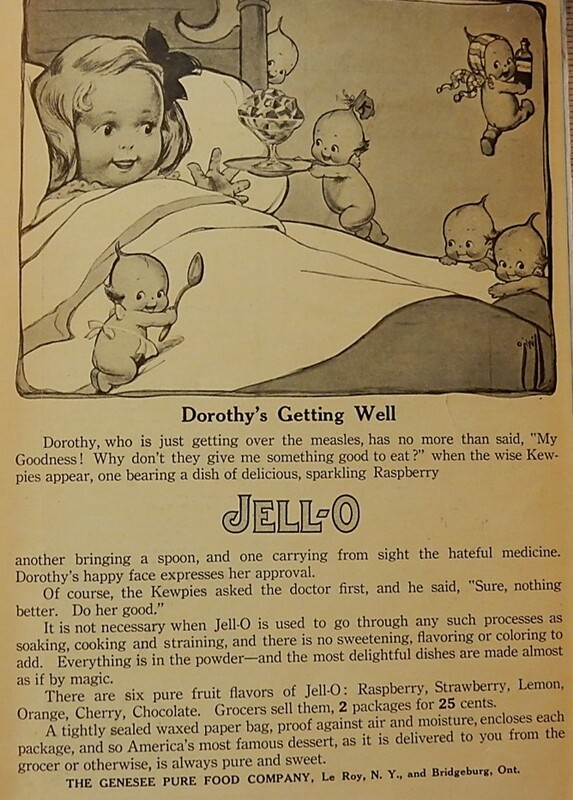 A 1919 Jello advertisement treats measles as a common ailment, and suggests that children who are sick with the measles might enjoy eating Jell-o while they recuperate. The first measles vaccines were introduced during the 1960s, and the Measles, Mumps, and Rubella (MRR) vaccine was introduced in 1973. I like that the Jell-O was described as “sparkling” and that kewpies served it. I’d feel better in an instant, too– if that happened to me. The word “sparkling” creates such a vivid word picture of a wonderful food. And what irony that the highest percentage of non-vaccinators in our country are well educated people who should know better, while mothers in an assortment of developing countries flock to vaccination clinics. In Liberia, the common saying was, “Don’t name your children until the measles has passed.” With a mortality rate of around 50% in the under-fives, it was good advice. I once worked with a woman who grew up in Cameroon. She told me about the custom of not naming children until they were over a year old. It is the saddest thing I have ever heard. It sure is a powerful indication of how fragile life was for infants. Whew, I had no idea how high the mortality rate was amoungst young children. That’s one charming advertisement! Good old jello .. somethings are still as good as back then. I have had all three plus chicken pox but I can’t recall eating jello…just remember moms cool hand keeping check on my hot forehead. I also had all three. My mother gave me frozen green beans (that were still frozen) to eat when I had a high fever with the measles – and my memory is that those icy beans tasted like the most incredibly wonderful food in my delirium. It’s amazing how long Jello’s been around. how delirious I got, I never experienced kewpies. 🙂 The Kewpies were supposed to be baby cupid figures and were very popular at the time. I did another post awhile back that also contained Kewpies. Isn’t Jello legendary hospital food.? It would definitely slide down a sore throat. One of my goals is to visit the Museum of Jello in LeRoy, New York. Yes, I think so. I can remember there being lots of Jello in the refrigerator when I was a candy striper at a hospital years ago. Until I read your comment, I hadn’t realized that there was a Jello museum. — Now that I know about it, I also want to visit it. There is beautiful Letchworth State Park near there with spectacular waterfalls that you can get really close to. I liked it better than Niagara, as it is not developed. I just googled Letchworth State Park and it looks wonderful. I’m really going to have to visit western New York. It’s wonderful to hear that you enjoy the old ads. I can’t quite picture what chocolate jello must have tasted like. Somehow I want to think that it tasted similar to chocolate pudding – yet actually it would have tasted quite different since Jello doesn’t contain milk. Wouldn’t the writer be surprised at all the flavors of Jell-O now? I bought a blue-colored one recently because grandson David’s favorite color is blue. We haven’t found the appropriate occasion at which to serve it. Maybe a blue Monday would be proper. Like carolanne78, I wonder what the chocolate one tasted like. How sweet and what fun that kids of all ages still enjoy Jello whether they’re sick or well! I definitely enjoyed eating Jello when I was a child. It’s wonderful to hear that you liked it. That is an interestingly odd but cute advertisement! Jello…’stands’ the test of time! I love it still! It definitely has stood the test of time. I had all three as a child – chicken pox, measles, mumps – and I also remember being given jello and popsicles. I love both of them to this day. I also was surprised by the high mortality rate that some of the other commenters cited. I wonder if the morality rate varied by country. The U.S. may have had better medical care in the mid-20th century than some other countries. Jello was always “sick food” for me. I also remember that when I was young, that Jello was considered an easy-to-digest food that was good for someone who was ill. I really like the sweet expression on the little girl’s face in the advertisement. And we are having a measles outbreak! I never would have expected that to occur in 2019. It’s interesting the illnesses the was common back then. I’m glad we have vaccines now for so many things. This ad definitely suggests that Jell-o has been considered for many years to a good food to serve when someone is sick. Nice! Where do you get all of these clippings from? I am fortunate to live near a very good library that contains lots of old books and magazines. When I have more time, I want to go to the library. Used to be one of my favorite places as a kid. Are you aware that Jello brand gelatin is the official favorite snack food of Utah? I hadn’t known that. I just learned something new. I wonder how it happened to be selected as the official favorite snack food of Utah. Loved seeing these old ads. I realized my mother was born in 1919 so if she was still living she would be 100 on her birthday this year. Thanks for the memory and interesting articles. It’s nice to hear that you enjoy this blog. I also had them as a child. The Kewpies serving Jell-0 takes me back. Though I’ve eaten Jell-O since then, I’m sure the nuns in St. Joseph’s Hospital served me the dessert that slides down so easily when I had my tonsils out as a child.